Monthly Challenges with Individualized Elements! This is a challenge community for Lord of the Rings Fanfiction and Fanart. We hold fic challenges every month and art challenges every other month. We also accept fanworks based on any of Tolkien's other Arda-based books including, but not limited to, The Hobbit, The Silmarillion, Unfinished Tales, The History of Middle-earth, and The Children of Hurin. Each month, the fanfiction Challenge will have a common theme, and participating authors will be assigned individualized elements to incorporate into their stories. Every other month, the art challenge will have a common theme and participating artists may be assigned individualized elements to incorporate into their work. Art may be in any media: traditional, digital, photography, photo-manips, sculpture or other arts or crafts. To receive your elements, you may e-mail the mods, or you may comment on the post announcing the challenge. You may post your story at any time before the deadline, as the posts will be moderated, and then unlocked on the date the stories are revealed. 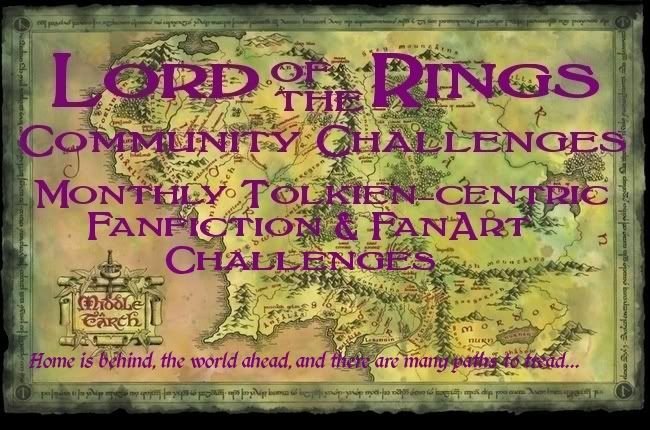 This is a challenge community for Lord of the Rings Fanfiction and Fanart. We hold fic challenges every month and art challenges every other month. We also accept fanworks based on any of Tolkien&#39;s other Arda-based books including, but not limited to, <i>The Hobbit, The Silmarillion, Unfinished Tales, The History of Middle-earth</i>, and <i>The Children of Hurin</i>. And tag your story with the month&#39;s theme. Tags will be announced with each month&#39;s challenge. You may post your art at any time before the deadline, as the posts will be moderated and then unlocked on the date that the art is revealed. Upload pictures of your project to your favorite photo-sharing site (Photo-bucket, Flickr, LJ scrapbook, etc. ), and then post the picture to the community by the deadline. <b>In the subject line place:</b> Art: Title of Work, by Your Name. Stories and/or art should be placed behind an LJ cut; the code for the cut is incorporated in the header if you use HTML. You will have to put it in yourself if you use Rich Text. If you have a problem with your cut, please let a mod know. You can edit an LJ cut once the post appears. Stories and/or art must appear online for the first time on the challenge date. Once the work is opened on the reveal date, you are welcome to re-post it anywhere else you like. We request that if possible you also upload it yourself to the Many Paths to Tread Archive . If not, one of the moderators will post it there within a few weeks. If you have any questions, please contact the moderators, <lj user="ceshaughnessy">, <lj user="dreamflower02">, <lj user="dawn_felagund"> or <lj user="ysilme">.